Popular in the late 1800’s and early 1900’s, Santal Midy consisted of distilled sandalwood oil in capsule form. 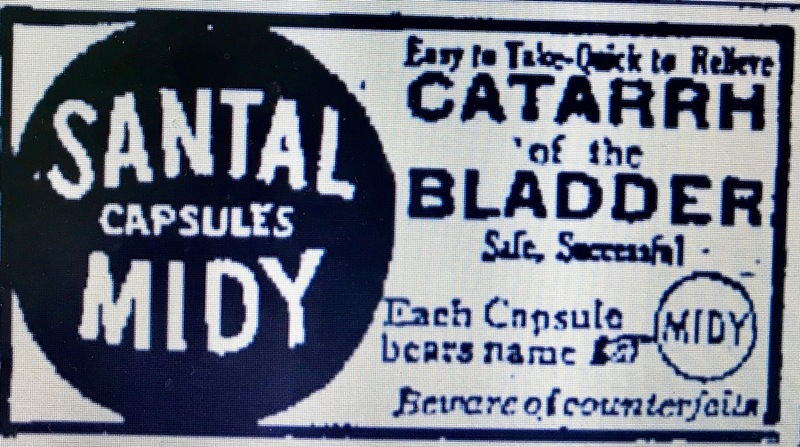 It’s popularity stemmed from the fact that it was marketed as a cure for gonorrhea and all forms of urethritis. A February 1893 advertisement aimed at retail druggists described the product in a nutshell. Court records from a 1918 trademark case stated that Santal Midy had been produced for over 40 years, dating it back to the late 1870’s. A French product, it was originally manufactured by F. Rigaud and later by his son Emile Rigaud under several different company names: Rigaud & Dusart, Grimault & Co., Rigaud & Chapoteau, Rigaud & Clermont and Rigaud-Vial. (Apparently Riguad changed the company name each time he associated with a new chemist.) Each company listed 8 Rue Vivienne, Paris, as their address. Rigaud’s career as a pharmacist was capsulized in a June 14, 1897 story in the Pharmaceutical Era. He realized the value of expert chemical assistance, and employed such men as Dusart, Vial Armaund, Sauthier and Chapoteaut. Gradually his firm absorbed the leading French specialties of established merit and brought them to the knowledge of medical men and pharmacists of every nationality and language throughout the globe. His commercial travelers who visited all parts of the globe were instructed to investigate new drugs and send samples to his laboratory, and many drugs now found in the pharmacopeias were introduced in this way. 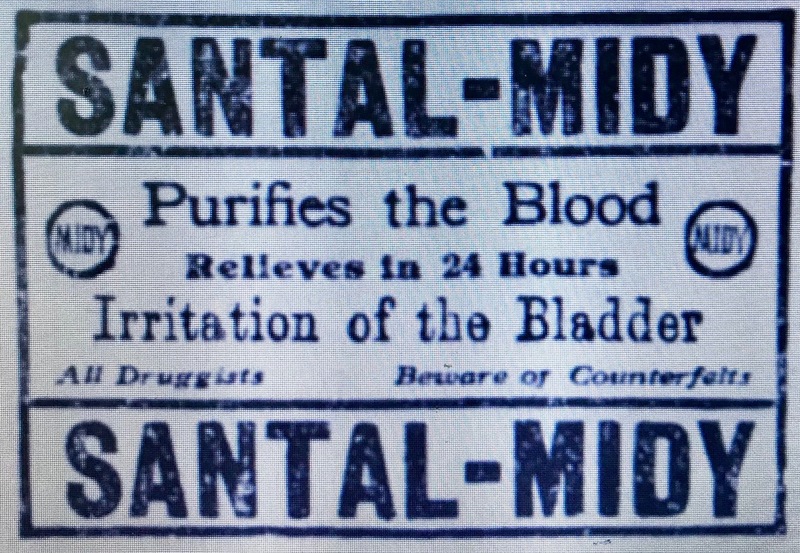 I have to believe that Santal Midy was one such drug. It apparently had its origins with a French chemist named Midy who operated a drug store at 113 Faubourg St., Honore, Paris. Later when it was manufactured by Grimault & Co., advertisements continued to name Midy’s drug store as the products’s French depot. By 1880, Santal Midy had made it to the United States where for several years it was apparently marketed exclusively in the French inhabited New Orleans. 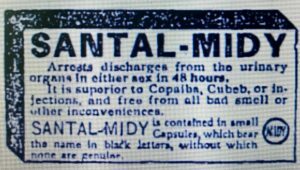 The first United States newspaper advertisement for Santal Midy that I can find appeared in the February 21, 1880 edition of The (New Orleans, La) Times Democrat. It was included in a menu of several products being manufactured by Rigaud & Dusart and sold through the local agent St. Cyr Fourcade. These capsules contain the extract of citrine sands of Bombay in all its purity. Numerous experiments, made in hospitals of Paris, have demonstrated that citrine sandal possesses greater curative powers than cupaiba and essence of turpentine. They cure in two or three days the most painful and obstinate cases, without giving any smell to the urine. They do not cause nausea, coil, diarrhea, and are very effectual against catharral affections of the bladder and emission of blood. 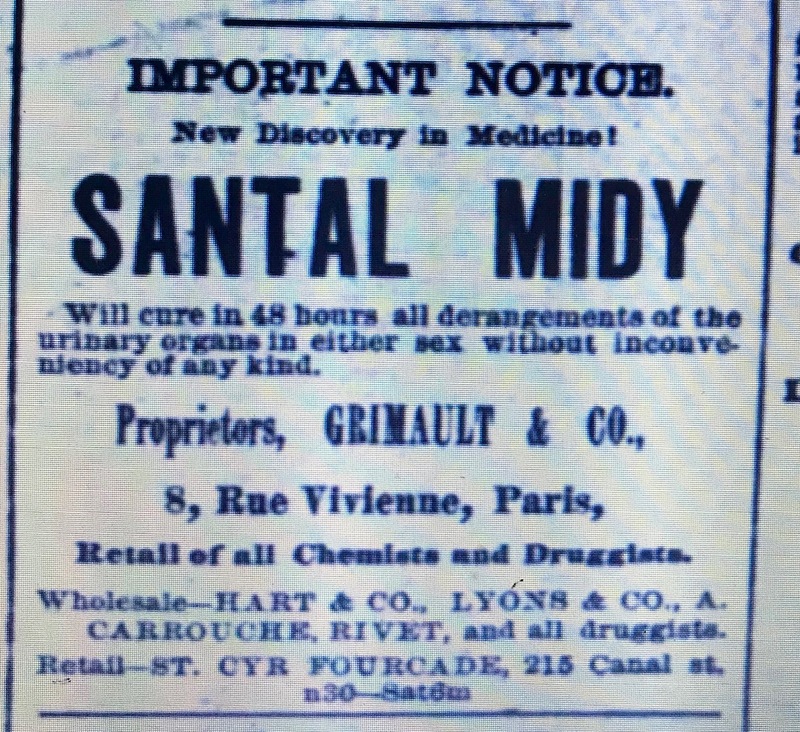 It wasn’t until 1883 that newspaper advertisements for Santal Midy began appearing in other parts of the country. 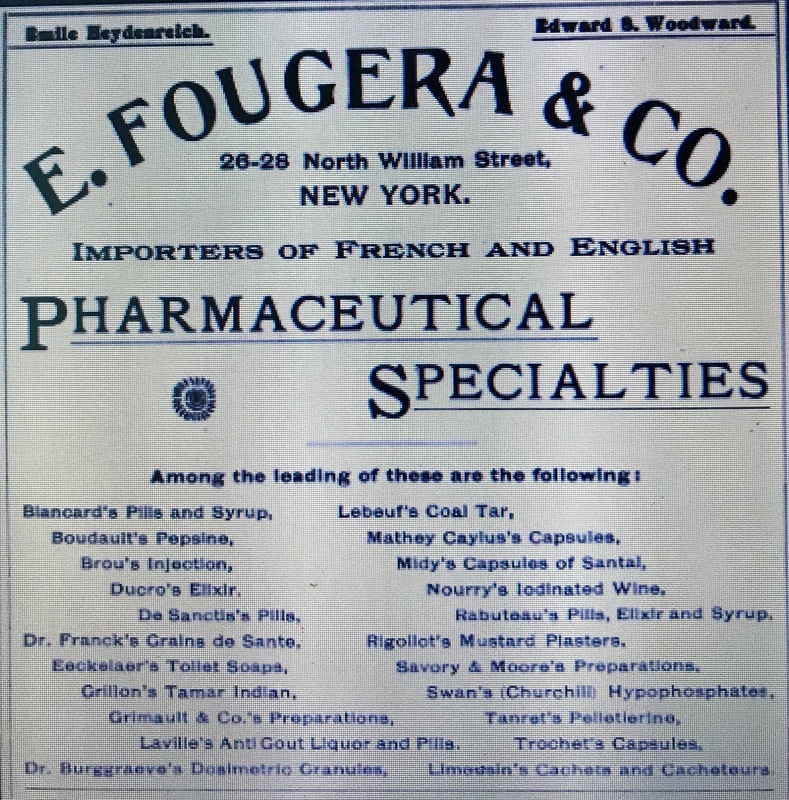 It was around this time that their advertisements began to identify the New York City drug firm of E. Fougera & Company as their sole agent in the United States. Over the next 50 plus years, E Fougera & Co., the Rigaud companies and Santal Midy would remain intimately connected. 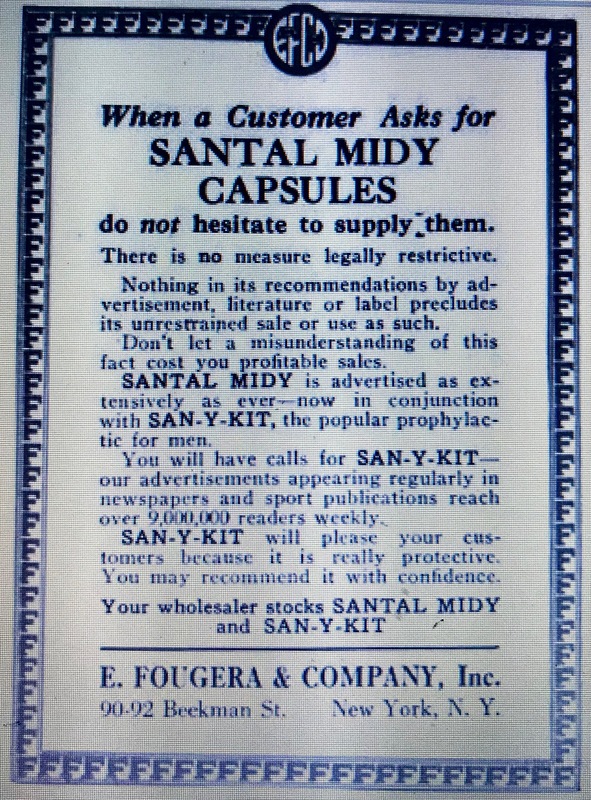 As far as I can tell, Santal Midy was produced in France with E. Fougera & Co. acting as Rigaud’s importer and American agent until sometime in the early 1900’s when its manufacture apparently shifted to the United States under the company name of Dr. Ph Chapelle. The firm of Dr. Ph Chapelle was first listed in the New York directories in 1915 so I suspect that it was around this time that the transition occurred. A July 7, 1922 “Letter to the Editor,” written by M. M. Sterling, then president of Fougera, to a publication called “Drug & Chemical Markets” confirmed that the Chapelle firm was also owned by Henri Rigaud. Mr. Rigaud is also owner of the business Ph. Chapelle, formerly known as Rigaud & Chapoteau, Grimault and Vial, makers of Santal Midy, Chapoteau’s Wine, Apioline, Morrhuol and Creosote, and other well-known proprietary remedies. The firm of Dr. Ph. Chapelle (sometimes Phillip Chapelle) was listed in the New York City directories from 1915 through the early 1920’s with an address of 92 Beekman which was at or adjacent to Fougera’s 90 Beekman Street address. The 1919 New York City Copartnership and Corporation Directory continued to name E. Fougera & Co. as Ph Chapelle’s agent. During the 1920’s and 1930’s Rigaud continued to manufacture Santal Midy in the United States under several different names, each still very much French sounding. In the 1925 directory they were listed under the name Laboratorie de Pharmacologie, Inc., and were still located with Fougera at 90-92 Beekman Street. Then, according to court records in New York’s Southern District (Etablissments Rigaud, Inc. v. Hey), on July 27,1933, Laboratorie de Pharmacologie, Inc. merged with Rigaud’s perfume company, Parfumerie, Rigaud, Inc, to form Etablissments Rigaud, Inc., with Fougera subsequently serving as the sole sales representative of the merged corporation. During much of the 1940’s, the address of Etablissments Rigaud, Inc. was listed as 79 Bedford, while Fougera had moved to 75 Varick Street. Both were registered as New York corporations. Records from another court case (Etablissments Rigaud v. Federal Trade Commission) described the relationship between Rigaud and Fougera at this time. Rigaud is a New York Corporation engaged in compounding perfumes and cosmetics which it sells solely to Fougera, another New York corporation. Some of the merchandise thus sold by Rigaud is delivered to Fougera in New York, while some is shipped to the latter’s customers on its order. The goods Fougera has so purchased it sells throughout the United States. The various ingredients used to make up the perfumes are combined by Rigaud with one another and with domestic alcohol at its place of business at 79 Bedford Street, New York City. When the ingredients are thus compounded they are bottled and packaged for sale. Some of Rigaud’s officers and five of its eight directors reside in Paris and to a considerable extent direct the business policy of the company, but Rigaud does not maintain any office there as a corporation. Etablissments Rigaud, Inc. was still listed in the Manhattan Telephone Book in 1949, after which I lose track of them. The company was not listed in 1959. Although Santal Midy was certainly being manufactured in the United States by 1915, it was clearly the aim of Rigaud and Fougera to continue marketing it as a French product. Their labeling in the late teens included the phrase quoted below which certainly implied French production while in smaller type they mentioned its U.S. manufacture. L. Midy, Pharmacien de lre Classe Paris Depot Dans Les Principales Pharmacies Dr. Ph. Chapelle Ancienne. Maison Grimault & Cie, 8 rue Vivienne, Paris. This caught the attention of the United States Food and Drug Administration who accused them of mis-branding. One judgement against the company in 1919 summed it up like this. It was alleged that said labeling was false and misleading in that the statement in French, quoted above, indicated that the article was a foreign product, whereas, in truth and in fact, it was not a foreign product, but was a domestic product, and which said false statement was not sufficiently corrected by the statement on the said label in inconspicuous type, “Bottled in the New York Laboratories of Dr. Ph. Chapelle. In 48 hours Gonorrhoea and discharges from the urinary organs arrested by Santal Midy Capsules without inconvenience. 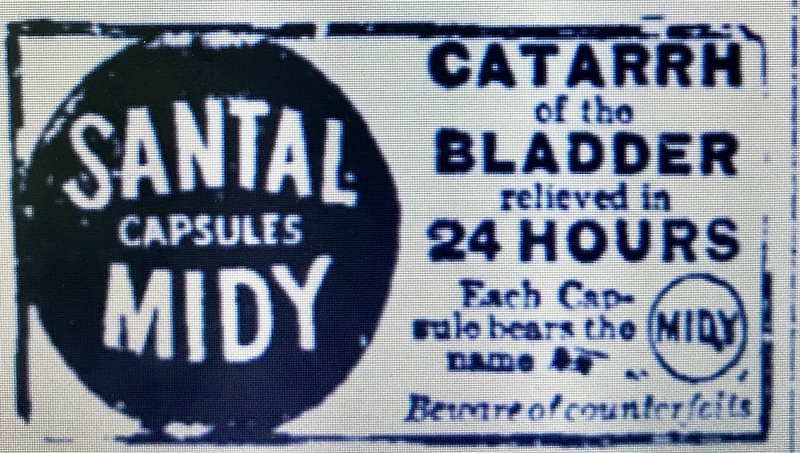 By mid-1909 the advertising copy had changed to “Relieved in 24 Hours.” The following advertisements that appeared in 1910 reflect this change. the curative and therapeutic claims made for the treatment of gonorrhea, fleet, etc., were declared false and fraudulent. In September, 1919, the court entered judgement of condemnation and forfeiture and ordered the product destroyed. …the article contained no substance and no ingredients and no combination of ingredients capable of producing the effects claimed. When a Customer Asks for Santal Midy Capsules do not hesitate to supply them. There is no measure legally restrictive. Nothing in its recommendations by advertisement, literature or label precludes its unrestrained sale or use as such. Don’t let a misunderstanding of this fact cost you profitable sales. 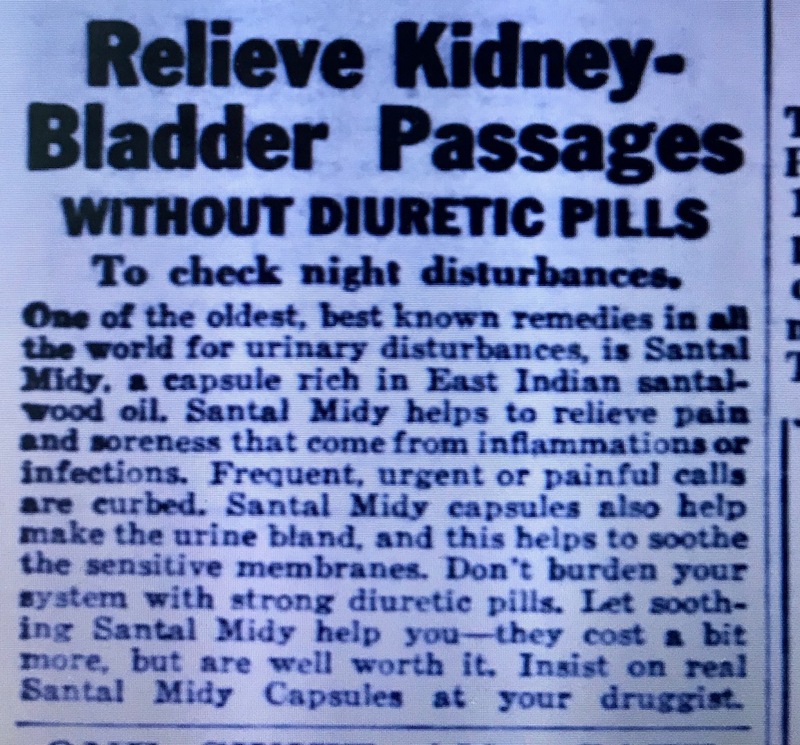 The above advertisement, circulated in 1938/1939, was the last newspaper advertisement for Santal Midy that I can find. How much longer Santal Midy was manufactured and sold after 1939 is not clear. Some later Santal Midy labels name Gallia Laboratories, 254 W 31st Street in New York City as a distributor so it’s possible that at some point after the 1933 merger Rigaud gave up the pharmaceutical piece of their business to focus on perfume but that is simply conjecture on my part. Rigaud perfumes are still made today. E Fougera & Company also exists today as a division of Fougera Pharmaceuticals. Located in Melville New York, they make generic topical steroids, antibiotics and anti-fungals for both prescription and “Over the Counter” markets. The bottle I found is a mouth blown, 10-sided vial embossed Santal deMidy, Paris. Recognizing it’s mouth blown it likely dates no later than the early 1900’s and was most likely imported from France.